Apple had an unusually embarrassing January, opening the month with a rare downward revision of its earnings guidance (see “Apple Warns of Lower Revenues, Blaming Slower Sales in China,” 3 January 2019) and closing it out with the acknowledgment of a humiliating FaceTime bug on, of all days, Data Privacy Day (see “Apple Disables Group FaceTime to Block Glaring Privacy Hole,” 29 January 2019). As a consequence, Apple’s quarterly conference call with financial analysts sparked more than the usual interest. First, here are the bare numbers for the company’s first fiscal quarter of 2019. Apple announced net profits of $19.96 billion ($4.18 per diluted share) on revenues of $84.3 billion. Those revenues are down 5% compared to the year-ago quarter, but the earnings per share are up by 7.5%. Before we dive into the breakdown, note that Q1 2019 represents some significant changes in how Apple reports its finances. 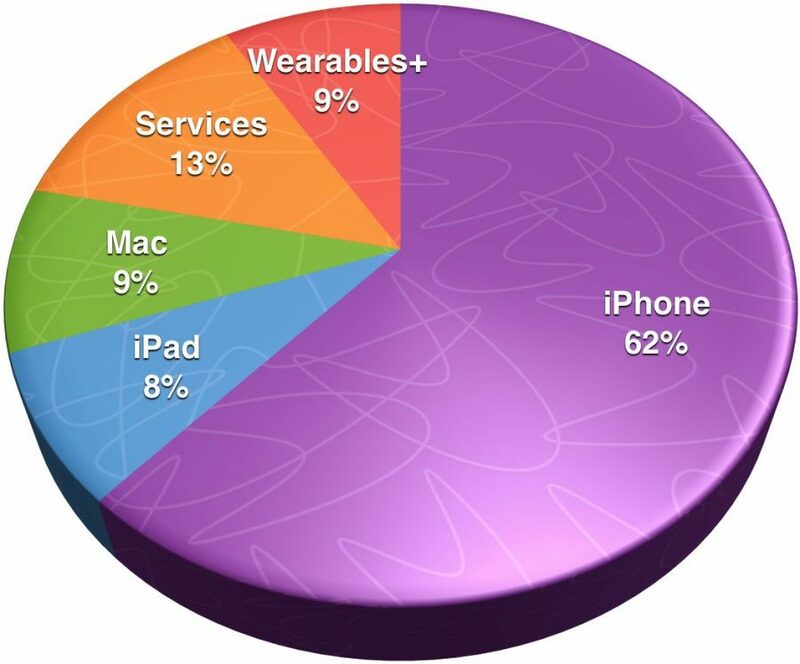 Apple no longer reports unit sales, though it still breaks out revenue by category. The Other Products category has been redubbed “Wearables, Home, and Accessories,” but for now we’ll use both names interchangeably, so as to chart that category’s historical trends. Also, the company is now reporting gross margin for both its physical products and its services. We also want to point out that the Q1 2018 numbers shared by Apple in its Q1 2019 statement are somewhat different than what it reported a year ago—see “Apple Posts Record Profits in Q1 2018, Though Unit Sales Flatten” (1 February 2018). 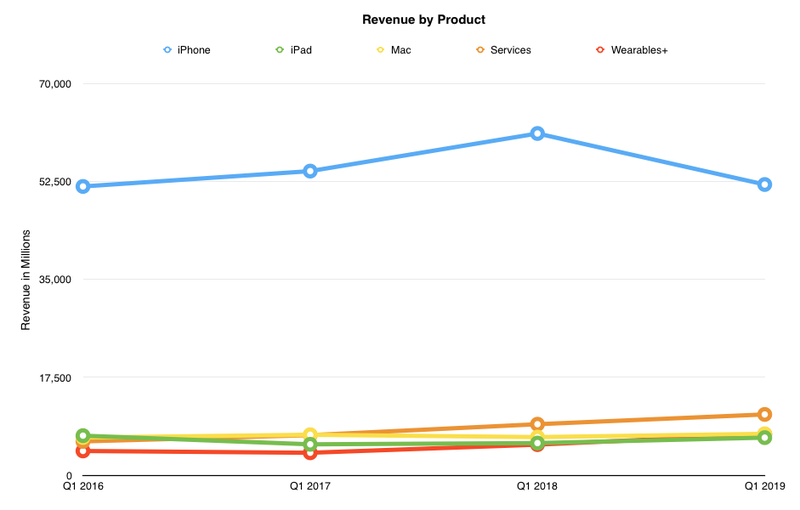 This is due to the fact that Apple now amortizes the cost of free services against the Services category and not the associated hardware category. iPhone revenues took a dive, but all other categories are growing steadily. CEO Tim Cook spent much of his opening remarks pouring oil on troubled waters, noting that while Apple’s overall revenues were down 5% year-over-year, and that iPhone revenues were down almost 15%, the Apple ecosystem continues to hum along nicely. He called out the Greater China market as the most significant contributor to the revenue decline by far, but he also noted that revenues for China still grew slightly for the full 2018 calendar year. It’s also worth noting that combined revenues for the geographic segments other than China were up 1.1% over the year-ago quarter. In contrast to the vexing iPhone revenue declines, both Cook and CFO Luca Maestri were pleased to point out that revenues increased for Apple’s other product categories. 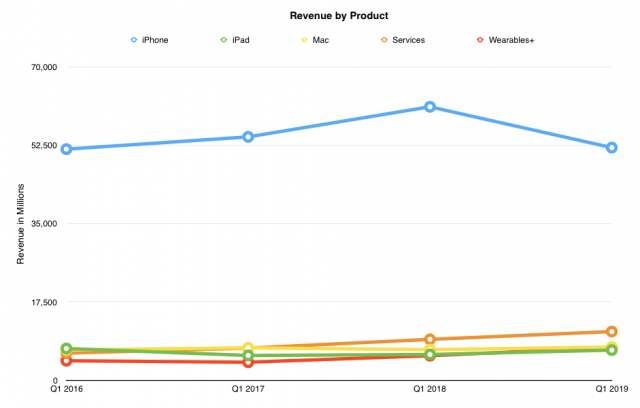 For example, Mac revenues were up by nearly 9%, iPad revenues increased 16.9%, and the renamed Wearables, Home, and Accessories category boasted a 33.3% revenue increase. Services posted increased revenues of 19.1% year-over-year. In an indication of Apple’s efficiency, the company reported a 38% gross margin overall, and while the iPhone segment had only a 34% margin, the Services segment posted a whopping 62.8% margin. You can see why Apple wants to grow Services. Interestingly, Maestri revealed that the most popular iPhone model in the quarter was the iPhone XR, followed by the iPhone XS Max, with the iPhone XS being the least popular of the three. Other points of interest: Apple Pay handled some 1.8 billion transactions last quarter, Apple Music now boasts 50 million paid subscribers, and Apple News currently has 85 million users. That last one is important to remember, given that Apple may launch paid subscriptions in Apple News later this year. One other note on the Services category, seen by many as the next big income growth category for Apple: Katy Huberty of Morgan Stanley remarked on the quarterly investor call that services revenue last quarter grew more slowly than it had in the past. Luca Maestri went to some trouble to explain that the perceived slowdown reflected changes in Apple’s accounting, including amortization of free services, foreign exchange rates (due to the strong dollar), and issues with the App Store in China. There is a supposed Chinese curse (its Chinese origin appears to be an urban legend) that goes, “May you live in interesting times,” and these are indeed interesting times for Apple. In some ways, this is the first real test of Tim Cook’s leadership of Apple. So far, he is passing the test. Although iPhone revenues took a hit this quarter, Cook was wise enough to see that as inevitable. Growth in Apple’s other revenue categories shows that Apple isn’t just a one-trick pony. While Cook may not bring the pizzaz that his legendary predecessor was known for, he has proven himself to be a steady hand at the wheel. Apple could—and certainly has—done a lot worse. Growth in Apple’s other revenue categories shows that Apple isn’t just a one-trick pony. Judging by the numbers that statement seems to still be a bit premature. Services earnings were up by less than $2B. The iPhone drop was $9B. The other categories don’t come close to making up for that $7B gap. Which is of course why their overall earnings took a big hit (for the first time in a while, admittedly). The next quarters will have to show if Apple can recover iPhone earnings. If not, their other categories will need to grow a whole lot faster than so far should they be able to make up for that. Judging by the numbers that statement seems to still be a bit premature. Services earnings were up by less than $2B. Just under $2B isn’t shabby at all, especially since it’s a 19% above last year. In the near future, there’s the no longer secret subscription video service that’s soon to released, as well as a news and periodical subscription offering. And lots of rumors have been swirling about an upcoming subscription gaming service. Down the road there’s autonomous transportation, AR/VR. Personally, I thin the bet on services will play out well as time marches on. The iPhone drop was $9B. The other categories don’t come close to making up for that $7B gap. Which is of course why their overall earnings took a big hit (for the first time in a while, admittedly). I don’t think I see it as that way. Apple still posted $84 billion with a capital B in revenues, and net profits of nearly $20 billion with a capital B. These are unimaginably large numbers. This is not a company that’s hurting in any known universe, so it’s not like there’s anything to make up for besides the previous year’s performance under different macroeconomic conditions in one major market. And even if China continues to slide compared to what it did before, what is the actual harm to Apple if it makes a few billion less per quarter? There’s no requirement that a company continue to grow, and the growth has to stop at some point. Sure, the stock price might drop, but so what? That’s all predicted on future beliefs anyway, not on reality. To my mind, what’s actually important is that Apple remains profitable, and at a level where there’s enough money to spend on potentially expensive R&D and manufacturing so there’s never a resource constraint on what it wants to develop and build. Indeed, how can one say that “Apple’s iPhone business may be struggling” if Apple rakes in so much money for selling iPhones even if they stopped to increase in that segment? As an Apple user I definitely agree with you, Adam. As long as Apple makes profit so that they can fund R&D work to develop Macs, iPhones/iPads, and their OSes, that’s good enough for me. But the whole kerfuffle Apple got into was not related to any of that, but shareholders’ expectations of steadily rising earnings. Indeed, in their world growth does not know any limits and stagnating earnings are grounds for grave concern. And it is that world and how it evaluates Apple that has put Tim in the recent spotlight. I think Tim is doing pretty well at saying that Apple is in it for the long term. It may not protect the stock price, but for the most part, the stock price is irrelevant. It might make it a little harder for Apple to attract top talent with stock options, but it’s unrelated to the actual performance of the company. Apple isn’t alone in having a drop in smartphone shipments—with only a few exceptions, pretty much every other smartphone manufacturer did as well. Got this from a research company. Samsung Electronics maintained its shipment-volume lead, shipping 70.2 million units in Q4 2018. Samsung’s negative growth rate in 2018 continued, as shipments declined 5.5 percent compared to the same quarter of 2017. As a result, its market share fell to 19.2 percent in Q4 2018, which is flat compared to the previous year. Severe competition from Chinese rivals in many regions continued to impact Samsung’s business – and has led to Samsung changing its strategy for how new technologies are deployed in the company’s product range. 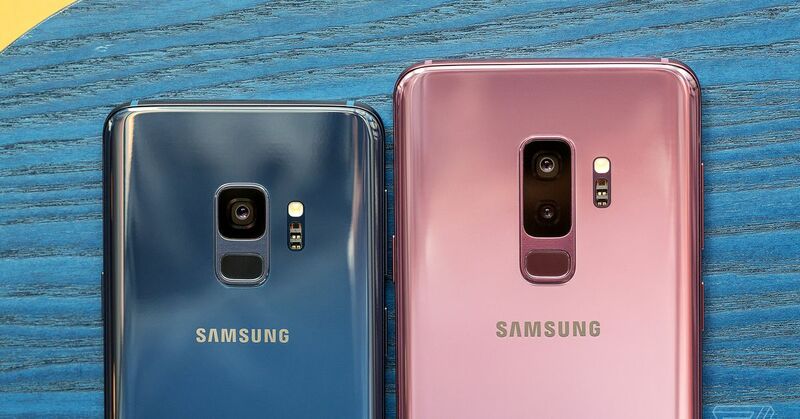 For example, the first triple-camera Samsung device was a Galaxy A phone and, instead of a Galaxy S device, Samsung released the world’s first quad-camera smartphone – the Galaxy A9 – last year. "Widening losses in the company’s struggling mobile business also dragged down profit, analysts said. “LG Electronics’ mobile business has not been generating profits at all. On top of that, high marketing expenses for its slow-selling handset models hurt the overall profit,” said Eo Kyu-jin, an analyst at eBest Investment and Securities." Samsung has reported its Q4 2018 earnings, and as predicted they’ve been hit by slow memory sales and a sluggish smartphone market. The Galaxy S10 is seen as a bright spot for the near future, however.